Global quality | What Car? Buy a Volkswagen and you buy into a brand that stands for quality in every area. However, consistently achieving that high standard across its extensive range is no easy task, especially when its cars are built at so many locations. VW's production is so diversified that it even builds different variants of the Polo and Golf in different continents. Three-door Polos sold in the UK are built in Spain, for instance, and five-door models in South Africa. Likewise, the Golf and Golf Plus are built in Germany, but the Golf Estate is built in Mexico. Frank Fischer is head of VW's new factory, in Tennessee, where the US Passat will be built. 'The fact we build cars across continents shows we have confidence in our ability to have high standards everywhere,' he says. As well as a standardisation of equipment, he highlights the exhaustive training recruits must go through before they get to work on a new car. 'Training lasts three months to a year, depending on the job they will do,' he says. 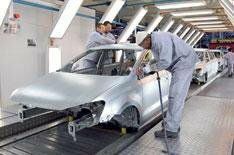 Before any new car is launched, VW will build around 350 pre-production cars to test its processes and improve them. Then, once the line is rolling, every car is briefly test driven before it goes on sale, ensuring the company hits consistent standards.